the Monorail Type of the size and shape given in the sketch, and are shod with strap iron, 1 in. wide and 1/4 in. thick. Round iron or half-round iron should not be used, as these are liable to skid. The square, sharp edges of the strap iron prevent this and grip the surface just as a skate. The top is a board 6 ft. long and 1 in. thick, securely fastened to the runners as follows: Blocks are nailed, or bolted, on either side of the upper edge of the rear runner and the top is fastened to them with screws. The runner is also braced with strap iron, as shown. The same method applies to the front runner, except that only one pair of blocks are used at the center and a thin piece of wood fastened to their tops to serve as the fifth wheel. The hole for the steering post should the Construction is Much More Simple Than Making a Double-Runner Bobsled be 6 in. from the front end and a little larger in diameter than the steering post. The latter should be rounded where it passes through the hole, but square on the upper end to receive the steering bar, which must be tightly fitted in place. 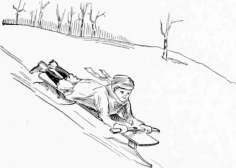 In coasting, the rider lies full length on the board with his hands on the steering bar. This makes the center of gravity so low that there is no necessity for lateral steadying runners, and aside from the exhilarating glide of the ordinary sled, the rider experiences a buoyant sense of freedom and a zest peculiar to the monorail type. Then, too, the steering is effected much more easily. Instead of dragging the feet, a slight turn of the front runner with a corresponding movement of the body is sufficient to change the direction or to restore the balance. This latter is, of course, maintained quite mechanically, as everyone who rides a bicycle well knows.-Contributed by Harry Hardy, Whitby, Ont.